Most people I know had never heard of ratatouille before the animated movie came out, and even now I don’t know many people who have given it a try. It’s really a shame because it’s delicious! This recipe is a bit of a twist on traditional ratatouille to make it healthier. It’s perfect for people who have avoided giving eggplant a try as well! Slice your eggplant into rounds about 1/3 inch thick and add to a bowl of salt water. Soak for 15 minutes and then drain. Place the rounds between paper towels and squeeze out the extra water. 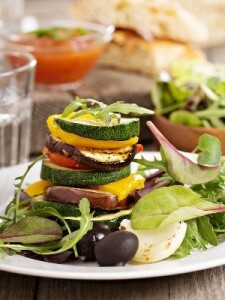 Slice the tomatoes, zucchini, orange bell pepper, and red onion into slices the same thickness as the eggplant. Remember to remove the seeds from the pepper! Heat your grill up over medium heat. Cover the grill with aluminum foil if needed. Brush the vegetables with the olive oil and grill them all until they’re soft and have grill marks. Divide the vegetables up onto plates with the eggplant on the bottom and then top with the other veggies. Drizzle with red wine vinegar and top with fresh basil. Enjoy while warm.